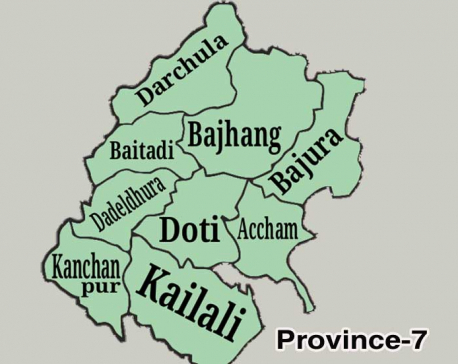 DHANGADHI, April 22: Jhapat Bohora, Minister for Internal Affairs and Planning in Province 7, has announced that the provincial government will be proposing a current fiscal year budget of Rs 1.2 billion that prioritizes agriculture . Organizing a press conference on Saturday, Bohora informed that the budget, which will be proposed at the provincial assembly on Sunday, will make locals feel the change. Though this was going to be a brief budget for the remaining three months of the current fiscal year, it would be an investment in the economic prosperity of the province, Bohora said. "There is high potential for agriculture in various parts of the province, but lack of irrigation, unavailability of seeds, traditional farming methods and other negative factors have been holding back agricultural production," he said. From now onwards crops will be cultivated only after testing the land for soil type and fertility, he added. Apart from agriculture, the budget will also prioritize health, education, forests, herbs and tourism among others and there are also some new infrastructure programs, he said. "There are 12 new priorities in this budget which will be disclosed only after the budget is duly approved," he said. Altogether 40 percent of the budget will reportedly be used for covering employee expenses and 60 percent will be for development purposes. The budget will be utilized for mobilizing the staffers of local units, regional offices and the provincial government. Programs and projects have been worked out through discussions with representatives, experts and others, it is stated. This is the first time a provincial government is bringing out a budget after the federal restructuring in the country. Trilochan Bhatta, chief minister of Province 7, stated that agriculture will be developed as the main income source of the province . "Our main focus will be to convince youths that they can make a good living by taking up agriculture instead of going abroad," Chief Minister Bhatta said.